RCM graduate Alec Coles-Aldridge humourously explores how the piano has been used in the comedic industry. Have you ever heard of PDQ Bach? Born on April 1st, 1742 in Leipzig, PDQ Bach was the forgotten son of JS Bach. His compositions include a Concerto for Horn and Hardart, Erotica Variations and the 1712 Overture. They often feature a range of unusual instruments; the bagpipes, the left-handed sewer flute and the tromboon (a trombone with a bassoon reed). 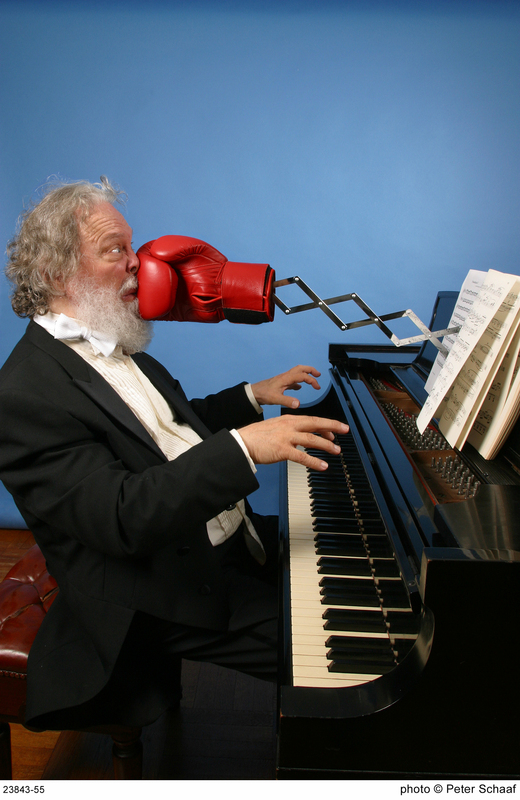 Saving the most important fact till last, PDQ Bach was actually invented by the American musician Peter Schickele. It was a humorous hoax that merged classical music and comedy. The hoax is part of a wider genre that presents classical music with a comic twist. Within this genre, there are those that feature the piano as the vehicle for humorous routines. Victor Borge and Les Dawson are perhaps two of the most renowned musicians who performed in this style and their results are highly amusing! Victor Borge was a Danish pianist, conductor, and comedian who earned the nickname, “The Clown Prince of Denmark”. After studying at the Royal Danish Academy of Music in the 1920’s, Borge began delivering comic routines, often featuring anti-Nazi jokes. Throughout his life, these routines were immensely popular, with jokes based around Beethoven’s Moonlight Sonata and Chopin’s Minute Waltz. His performances litter the Internet and are well worth watching. Les Dawson has a somewhat different style. One particular routine that Dawson regularly employed was the simple, yet effective, trick of playing well-known music with deliberately wrong notes. The resulting distortion of a familiar tune produces some hilarious results. Another Dawson sketch worth watching is the collaboration between Dawson and Shirley Bassey. The sketch begins with the distortion of a familiar tune and turns into a humorous dialogue between the two musicians. Dawson, pretending to reminisce over a career as a classical pianist, delivers the fantastic punch line that his career has been so unlucky he “peeled a banana and found it empty”. Any account of the piano in comedy would not be complete without Rowan Atkinson. Whilst Atkinson does not perform through actually playing the piano, he has used the idea of performing on the piano as the focus for comedy. The 2012 Olympic Opening Ceremony is one such example; an entertaining sketch that focused on a bored pianist condemned to a repetitive musical motif. In addition, the sketch “The Piano Player” combines Atkinson’s skills with the world of the piano; using mime to poke fun at the classical pianist. Clearly, the piano has a continuing place in comedy. Throughout the years, the piano has been the focus for multiple comedians with a huge variety of comic ideas being performed.